"Anju, Im cooking dinner" Shuka&apos;s casual reply, followed by a casual shrug. Anchan pouted and went to sit on the sofa while sulking. Shuka prepared the food on the table while Anchan was still sulking and completely annoyed at Shuka&apos;s phone for ringing so much. "Please don&apos;t tell me Yuki is bothering you again" Anchan whined even more. Shuka just chuckled and went towards Anchan and leaned over, hand on the body of the sofa and face an inch closer to Anchan. "No silly. It&apos;s the fans on twitter reacting to the photo of us that I posted" A slight chuckle was released from Shuka&apos;s mouth before she gave Anchan a quick peck on the lips. "Now come on, dinner&apos;s ready" Shuka said as she went to the table and sat down. Anchan didn&apos;t follow, instead she got her phone and opened up her twitter account. It&apos;s been a while since she was active since she last posted way back last year was it? Anyway, she immediately went to look at Shuka&apos;s account and yes, there was indeed a photo of her and Shuka in their yukatas and almost 20 thousand people have liked already and still ongoing, she decided to look at the comments and found herself smiling at the comments like "AnShuka!" "Omg my heart!" "Anchan and Shukashuu!!" Just as she was about to end scrolling down, she noticed an even earlier post of Shuka. It was photos from their shoot and this time not the sample of the original ones but offshots. She noticed that even in offshots they were awfully clingy. Too clingy. Even the post before that was a video of them wherein Yuki held Shuka&apos;s hand THE ENTIRE TIME. But no, they&apos;ve been through this, the photoshoot&apos;s done, no more Yuki in their lives. Anchan refreshed the page to see how many people have liked their photo but what she saw was not their photo but another post on top of it. It seems Shuka got mentioned by Yuki on a post. Another set of offshots. Another set of unending holding hands. 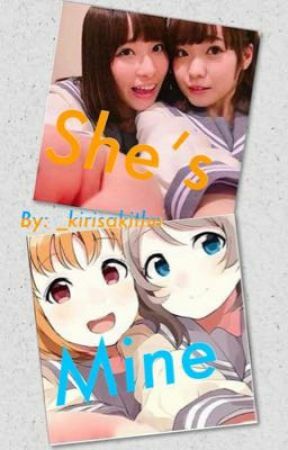 Even with the caption "Yuki and Shuka" "YukiShuu" and yup that is it. Through this or not, Anchan won&apos;t lose this war. So she commented on it saying "Lol, She&apos;s mine " and not even a minute passed but fans already came flooding in her notifications. Likes and retweets everywhere, even replying to Anchan&apos;s tweet like "ANSHUKA IS SO REAL!!" "I THINK MY EYES ARE DECEIVING ME" Anchan smiled in victory as she put her phone down and went to finallt sit at the dinner table. "What&apos;s gotten you so smiley?" Shuka asked, still eating the sukiyaki she just made. "Not really what, more of a who" Anchan grinned but Shuka frowned as she sat her chopsticks on her bowl. "Oh really? Who? Rikyako?" Shuka&apos;s irritated tone was more than evident. "Hmm...maybe?" Anchan teased but Shuka wasn&apos;t amused. She rolled her eyes and got her utensils and went to the sink to wash them. "Wash the dishes once you&apos;re done eating" Shuka said not daring to look at Anchan. No reply from Anchan and no movement could be heard either much to Shuka&apos;s disappointment. She was about to finish washing when a body was wrapped around her from behind and a head was rested on the back of her shoulder. "Shuka, Im joking. I was just teasing" Anchan said while hugging Shuka closer. "Im not" She replied as she successfully got out of Anchan&apos;s grasp and is now facing the pouting Anchan whose gaze was averted. "It&apos;s getting kinda late. Your dad is so gonna get mad at you" their lips are the only ones who parted, they were still holding each other. Forehead against forehead, noses against noses. "I don&apos;t mind getting scolded if it means spending more time with you" Anchan&apos;s bold reply. Shuka just chuckled as she gave Anchan yet another lovely kiss. The next morning, Shuka woke up to an amazing smell of bacon and eggs and Anchan not sleeping beside her. Before she went out she noticed her phone keeps on vibrating at a comment of Anchan yesterday so she decided to check it out. Her face couldn&apos;t be anymore redder as she saw Anchan&apos;s "Lol, she&apos;s mine "  and the people backing her up. "INAMI ANJU!!! WHAT IS THIS?!" She shouted much to her siblings annoyingness as a bunch of "SIS IT&apos;S WAY TOO EARLY TO BE SHOUTING!" came as a reply.